OXFORD, Miss. 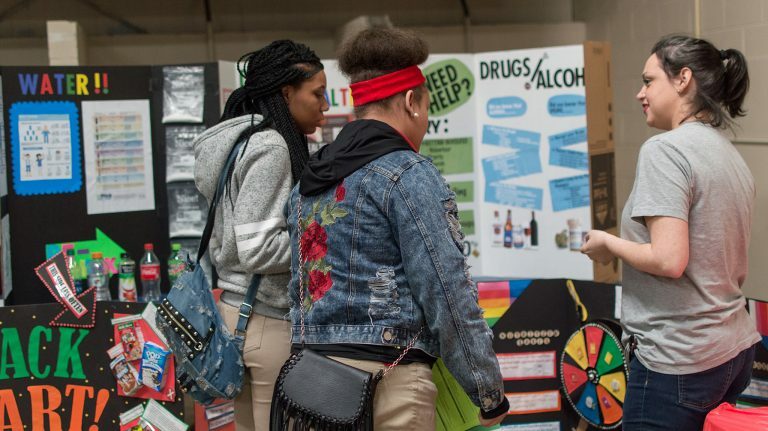 – Faculty and students from the University of Mississippi recently helped coordinate and host the Quitman County Career and Health Fair to educate Marks-area high school students and community members on career opportunities and healthy living. The career and health fair stemmed from the university’s partnership with the Marks Project, a nonprofit, community-based outreach program launched in 2016 that focuses on improving the overall quality of life for citizens of this struggling Delta community – a project supported by numerous, interdisciplinary faculty delegates from Ole Miss. Kegi Wells, Quitman County curriculum coordinator and member of the Marks Project, expressed a need for a career fair to help inspire high school students. With the imminent opening of a community fitness center, where UM volunteers will help conduct regular health assessments, the group decided to expand the career fair to include a health component. “Our students, along with student volunteers from the Department of Sociology and Anthropology, were trained at the University of Mississippi Medical Center to collect blood glucose samples and blood pressure readings, as well as calculate body-mass index,” said Georgianna Mann, assistant professor of nutrition and hospitality management. Besides gathering data, this event was meant to help Quitman County students become aware of all the opportunities available to them and to help the Marks community become better connected to outside communities, Mann said. Kymberle Gordon, of Canandaigua, New York, works with the Marks Project and is earning her doctorate in nutrition and hospitality management. She finds the community to be a welcoming place to conduct research and knows the importance of understanding its culture while researching. At the event, Gordon gathered data to better understand the food environment and level of physical activity in Quitman County by conducting a food access and physical activity survey. Dria Price, a senior Spanish, nutrition and international studies major from Oxford, attended the event to begin observing fellow student researchers in preparation for her upcoming project examining food insecurity in Quitman County. Anne Cafer, Assistant Professor of Sociology & Anthropology, regularly works with the Marks Project and helped organize the student-led effort. This project is just one component of the university’s larger effort to meet needs that communities have through outreach and engagement, Cafer said. The projects she has students complete are based on the needs of communities. Connor Ball, a senior pre-med biology student from Madison, reached out to Cafer when searching for a research project based in health and nutrition to help with his medical school application. 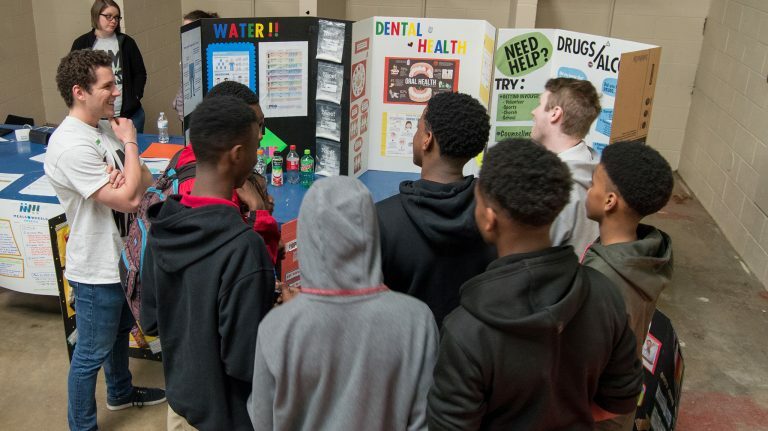 He joined other UM students in hosting a poster session that explained to participants the importance of hydration, dental hygiene, drug and alcohol awareness, portion control, and smart snacking. “We study what the issues are, where they come from and what kind of solutions we can create for the future to produce a steady incline in the health and nutrition status here,” Ball said. One of the group’s goals is to increase citizens’ knowledge of health and how to treat themselves, Ball said, explaining that collecting data allows the team to find trends and detect specific issues. The Quitman County School District and its Career and Technical Center coordinated the event. Partnering with the university and adding a health component offered students a range of valuable information, said Cynthia Washington, the district’s career technical education director. For more information on the Marks Project, visit http://www.marksproject.org. For more information about UM programs in nutrition and hospitality management, visit http://www.nhm.olemiss.edu. Lamar Hall is located at 615 Grove Loop on the Oxford campus of the University of Mississippi.